I found the book I mentioned earlier! I thought I remembered the title, and I was pretty damn near right. 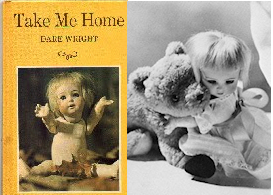 Take Me Home by Dare Wright was a staple of my childhood. It was my sister’s book, but I got it once she outgrew it. I was always painfully sad over the thought that the doll was left sitting in the woods. It seemed so real to me because we had the same sort of woods right out behind our house. And I had a doll. Yes, yes, I did. It could happen, I thought. Every time I went into the woods, I looked for lost dolls and other toys. No toy would ever be left to feel unwanted as long as I was on duty! Because, you know, it just wouldn’t do to have any toy feel unloved. They were living, breathing creatures, just as I was. Seriously. I thought this. I remember being as young as two and thinking this. I had a very dramatic and active imagination back then. What? You expected something different from me? Yes, even as a very small child I would lose myself in the magic of books and my own little blonde head. Oh, the places I went as a kid. All I had to do was grab a book and find a quiet corner and I was off in my own world. Making this even more magical: Dare Wright grew up in Cleveland, Ohio, like me (at least until I was seven). And she loved all manner of artistic pursuits. Just like me. Especially photography. Again…need I say it? Of course, our lives were very different, but it seemed there must have been some magic there. It also seems to me that we, at one time, possessed other books by Wright. There was a whole collection. For me, though, Take Me Home was the one that mesmerized me and the one I remember to this day. I guess I can also call this my default catch up entry for PROMPTuesday #37. I can, can’t I, Deb? Sounds so much like my childhood it scares me! Were we separated at birth?? I think so, Pam. Cuz, I’ve always maintained I was adopted, too. This sounds like such a good book! It would have driven me into a melancholy coma as a child though. I need to go look it up; I’m hoping it’s on Amazon? mannequin: You’ll have to look far and wide for a copy of this book. They’re trying to get it in circulation again, but there’s always “The Little One” that seems to be slightly less rare, and truly just as good. The real clincher to all the books is the singular uniqueness of the photography and the storytelling. Some suggest that Dare Wright had major psychological problems and stilted growth. Maybe it’s true. All I know is that it was a different era back when these were written and I’d use that magic looking glass while reading the books now. Just sayin’. I think they’ll appeal to you simply because they are so authentically innocent and “different”. Deb: The doll always made me melancholy. I felt so bad for her being alone. (Hence the Lonely Doll series title) For me, the doll was just as real as I was. Sorry about your doll issues. i’m like that about eels and leeches and aye-ayes. They’re just wrong. Wrong I say! I had this book as a child. I bought it at my friend’s rummage sale. I LOVED it!!! My older sister threw it away in the 90’s while cleaning my parent’s home. I long for this book. I LOVED all I have seen and read in the past years. Dare was so extraordinary!! !